Unemployed and low-wage workers in San Francisco may have less in their wallets as the cost of living rises, but at least half of them could be putting more food on the table than they realize. Only about 50 percent of eligible families participate in CalFresh, California’s food stamp program. This is also known as SNAP, the Supplemental Nutrition Assistance Program. The most common misconception among Latinos is the fear of being deported, she said. A rumor circulated that the children of families receiving food stamps must pay for it by enlisting in the army. And many don’t realize that being denied one month is often a temporary condition. Eligibility can fluctuate from month to month as incomes and food allotments do. Mayela, 31, is a current resident of San Francisco. She wishes to keep her last name anonymous for fear of deportation. After struggling to put food on the table, the single mother of two attended a CalFresh event to see if she was eligible. Her application was approved the same day. One in Four San Franciscans are considered nutritionally starved, according to a report from the city’s Food Security Task Force. This means that some people may be able to buy processed and packaged goods but cannot afford produce and nutritional foods. And 11,000 students who receive free school meals are not enrolled in CalFresh but are eligible. Programs like Eatfresh, an online resource for eligible CalFresh participants, provide additional support for those in need. The program promotes cooking at home and healthier alternatives. The website contains recipes full of ingredients that CalFresh individuals can obtain. “This program is all about cultivating people’s empowerment through food and awareness,” said Monica Bhagwan, the Eatfresh program manager. The San Francisco Board of Supervisors pledged to end hunger in San Francisco by the year 2020—in part by encouraging more people to apply for food stamps. 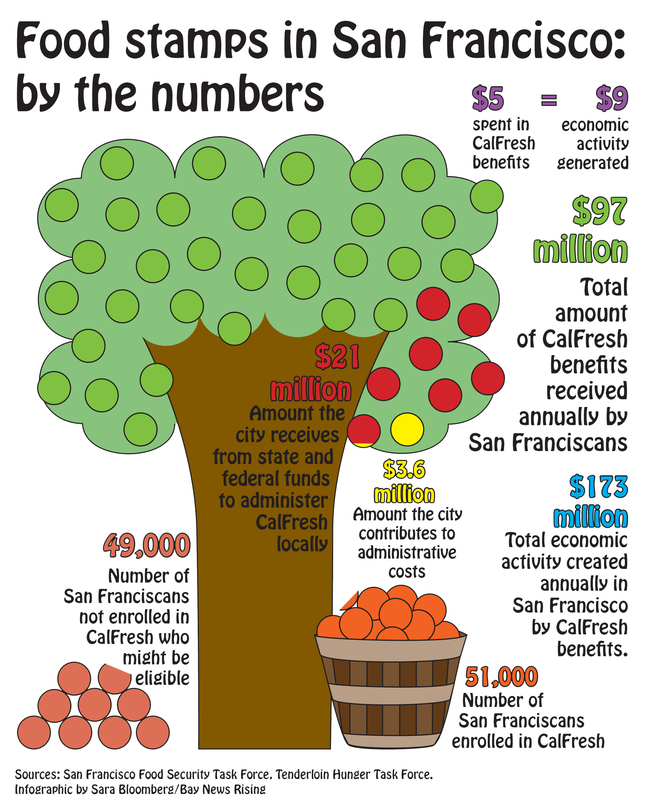 May was CalFresh awareness month, which consisted of events where people can figure out if they are eligible, such as one at the Careerlink Center in the Mission district. Eighty-five percent of the cost of administering food stamps locally comes from federal and state budgets. The city contributes $3.6 million, which covers the rest. According to the Food Security Task Force, a 25 percent increase of food stamp participation would generate about $43 million of additional economic activity per year in San Francisco. As a state, California is ranked second to last in the United States for participation in food stamps. Low participation is not only leaving the kitchen cupboards empty, but robbing the state of a significant economic boost. This entry was posted on July 28, 2014 by skettios99.